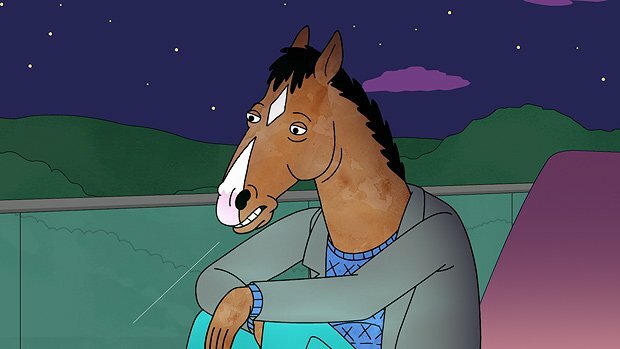 There's huge emotional payoff towards the end of the new series of BoJack Horseman that's got more than a hint of Don Hertzfeldt's insightful and poignant animated tragicomedy to it. But before the heavy stuff kicks in the usual antics and detailed background jokes deliver the big laughs. RuPaul, Andre Braugher, Felicity Huffman and Sharon Horgan are new additions to the voice cast and astute digs at reality TV shows, the fashion industry, American Crime Story and the constant flux of ridiculous film remakes are all on point. The election process is cannily satirised with Mr Peanutbutter running an absurd campaign for governor. Diane is struggling to engage with her job at Girl Croosh blog which lands her writing political articles of substance that no one reads. BoJack is nowhere to be seen after the death of Sarah Lynn and Princess Carolyn is on another downward spiral as she attempts to have it all. Meanwhile Todd becomes a fashion icon. Creator Raphael Bob-Waksberg continues to delve into serious subject matter with genuine compassion and humour. In season four he explores family lineage looking at how the past is sometimes forgotten when everything in the present is going bananas. The show even looks to the future for answers with everything merging to create a fascinating picture of inherited traits and emotional scars. War, drones, the dangers of fracking, Alzheimer's, asexual dating and miscarriage are all up for discussion with one of the new characters focusing a light on eating disorders and the sickening way the female body is constantly judged and shamed. By this point Bob-Waksberg really has the viewer invested in every central character and as they each go through their existential crises you're with them. Diane and Mr Peanutbutter struggle to find equilibrium in their relationship, Todd is blindly enjoying the ride, Princess Carolyn needs a little help from her friends and BoJack's bitterness turns even more sour. Season four is as powerful, funny and true as ever in its depiction of human nature. BoJack Horseman is on Netflix from Fri 8 Sep.